The biggest lie in cinema is a title card claiming the movie is based on a true story. Hollywood loves such movies. Each year, a bunch of them get nominated for Academy Awards, as if a real-life basis somehow makes one movie "truer" than one that is purely fictional. Meanwhile, at least since The Blair Witch Project, horror movies like to pretend they're in some way based on true events. Yet sometimes, real life produces stories that strain viewer credulity more than any Hollywood screenplay. After all, the difference between reality and fiction is that fiction has to make sense. Here's a list of 16 movies based on unbelievable true stories. Some of them are terrifying and others inspiring, but all of them are incredible. With a title like 50 First Dates, this 2004 movie sounds like a story about the world's worst pick-up artist. Actually, it's both better and worse than that. On one hand, it's a romantic comedy about a guy trying to woo a woman (Drew Barrymore) who, after suffering a car accident, develops a mental condition that makes her forget everything that happened the day before (good). On the other hand, the guy in question is played by Adam Sandler (bad). Although the movie's Goldfield's Syndrome is purely fictional, it has some real-life basis in the retrograde amnesia. In 2010, researchers described a woman who, after an accident, developed a kind of memory impairment similar to the one in the movie. However, that woman also saw 50 First Dates after her accident, which may have influenced her own interpretation of her condition. Similar cases of retrograde amnesia have surfaced since, like the case of Nikki Pegram who, after hitting her head, believes that every day is October 15, 2014. Derice Bannock (Leon Robinson) is a Jamaican runner who fails to qualify for the 1988 Summer Olympics. Frustrated, Derice and his best friend Sanka Coffie (Doug E. Doug) approach retired bobsledder Irv Blitzer (John Candy) with a desperate plan: they want to enter the 1988 Winter Olympics as a Jamaican bobsled team with Blitzer as their coach. With no experience, money or sponsors, Derice, Sanka, Junior Bevil (Rawle D. Lewis) and Yul Brenner (Malik Yoba) are truly the ultimate underdogs. Cool Runnings was very loosely inspired by the real Jamaican bobsled team that competed in the 1988 Winter Olympics in Calgary, Canada. Real Jamaican bobsledders were recruited from sprinters in the Air Force. While in the movie, the Jamaican team gets mocked by the other athletes for their lack of experience, nothing like that took place in real life. True to the spirit of the Olympics, other athletes treated them as equals and offered them spare equipment, advice and help. Despite their poor results in the competition, the Jamaican participation in the Winter Olympics became a point of national pride. We all know the story of Rocky Balboa (Sylvester Stallone). Rocky is a small-time boxer from the slums of Philadelphia who gets his shot at the world heavyweight championship. His opponent is the current champion Apollo Creed (Carl Weathers). Although Rocky loses in the end, he nevertheless gains everyone's respect - including Creed's - for lasting 12 rounds in the ring with the champion. Rocky itself was an underdog of a film: made for a mere $1 million, it earned over $200 million at the box office and won three Academy Awards. At first, producers planned to cast an already established actor in the lead role, but Stallone insisted on starring in his own movie. After all, he wrote the screenplay for Rocky in three and a half days. He was inspired by the 1975 championship match between Mohammad Ali and Chuck Wepner. Wepner used to box while serving in the US Marines. Later, he fought (and lost) fights with George Foreman and Sonny Liston. In 1975, Wepner accepted an opportunity to box against Muhammad Ali for $100,000. He trained for eight weeks and, despite losing, lasted far longer in the ring than anyone ever expected him to. Jack Black plays Ignacio, a cook working in a monastery orphanage. Since the orphanage lacks money to feed the children properly, Ignacio decides to become a luchador - a Mexican wrestler. By participating in the wrestling matches under an assumed identity, Ignacio hopes to earn enough money to take care of the kids. Cheap laughs and even cheaper sentimentality ensue. It is the true story behind Nacho Libre that is much more interesting. Sergio Gutiérrez Benítez was born in 1945 as the sixteenth child in his family. By the age of 22, he was already an alcoholic and a drug addict. However, he found himself drawn towards religion and eventually started his own orphanage. Benítez decided to become a luchador after seeing a couple of Mexican movies in which - you guessed it - a priest covertly fights as a wrestler to save his orphanage. Benítez adopted the name Fray Tormenta or "Friar Storm". Mixing his priorities somewhat, he later explained how he hid his true identity as a priest because, otherwise, nobody would have taken him seriously as a wrestler. Even today, Benítez holds mass wearing a luchador mask, which is awesome. Beloved family musical The Sound of Music follows a perky young governess Maria (Julie Andrews) as she falls in love with a retired Austrian officer Georg von Trapp (Christopher Plummer) while taking care of his numerous children. The movie ends with the two of them getting married... Except it doesn't really, as soon afterward, the Third Reich occupies their country - as it was wont to do. By the end of the movie, the von Trapps find themselves on the run as the objectors to the Nazi regime. It's a strange, almost unsettling twist for such an upbeat musical, but it's based on real events. The von Trapp family really existed and worked as entertainers to supplement their income, since they had been hit hard in the 1930s by the Great Depression. After George von Trapp died in 1947, Maria published her autobiography. While Hollywood producers were still reluctant about adapting Maria's book, Germans filmed not one, but two movies about the adventures of the von Trapp family. To this day, the 1956 movie The Trapp Family and its 1958 sequel The Trapp Family in America remain highly popular in Austria and Germany, even more so than the American 1965 musical The Sound of Music. The military career of Audie Murphy sounds a bit like Captain America's origin story. Murphy was born in 1920s to a poor family. When World War II broke out, he tried to enlist in the Army, the Navy and the US Marines. Murphy was repeatedly turned down for being both underage and underweight. He eventually managed to join the US Army, but only after he falsified his birth date. Unlike Captain America, Audie Murphy never gained any superpowers. That didn't stop him from becoming one of the most decorated US soldiers of WWII. Murphy even got to play himself in the 1955 war movie To Hell and Back. Among Murphy's other heroic deeds, the movie depicts a military action for which he was awarded the Medal of Honor. In January of 1945, Murphy's men found themselves under a heavy attack by the superior enemy forces. Murphy ordered his men to retreat. Alone and wounded, he kept his post atop a burning M10 tank destroyer for over an hour. Using the tank destroyer's machine gun, Murphy managed to kill some 50 German soldiers and stopped only after he ran out of ammunition. The Terminal tells a story of Viktor Navorski (Tom Hanks), a traveler from the fictional nation of Krakozhia who gets stuck at John F. Kennedy International Airport after his passport becomes invalid, due to a civil war that broke out in his country. Unwilling to return home and unable to enter USA, Viktor instead decides to camp at the airport until his situation gets resolved, spending free time by wooing a flight attendant played by Catherine Zeta-Jones. It's a cutesy version of the real-life story of an Iranian refugee Mehran Karimi Nasseri. In August of 1988, Nasseri arrived at Charles de Gaulle Airport in Paris with an intention of travelling to Great Britain. Lacking a passport, he was turned away by the UK immigration officials, but couldn't legally be returned to his origin country. Instead, Nasseri spent the next 16 years living in an airport lounge. After a hospitalization in 2006, he continued living in a Paris shelter. Besides Spielberg's movie, Nasseri's absurd story inspired at least three other movies, a series of articles, a book and even an opera. By the ripe old age of 21, Frank William Abagnale, Jr. (Leonardo DiCaprio) has already successfully posed as an Pan American World Airways pilot, a physician, a lawyer and a U.S. Bureau of Prisons agent. He forges checks and performs cons worth millions of dollars. However, Frank is doggedly pursued by an FBI bank fraud agent Carl Hanratty (Tom Hanks) who chases him all around the globe. There's something almost admirable about con artists. Bank robbers and murderers are often brutal, while mobsters are nothing more than glorified bullies. But a great confidence game requires a level of talent, charisma and skill that turns it into a true craft, if not art. It's no wonder that Hollywood filmmakers were drawn to the true story of Frank Abagnale, who ended up in prison only to then join the FBI as an expert for detecting forged checks. However, it took more than 20 years for his story to reach cinemas. The list of would-be directors included the likes of Cameron Crowe, David Fincher and Gore Verbinski. Finally, Catch Me If You Can was directed by Steven Spielberg, who once again collaborated here with Tom Hanks. 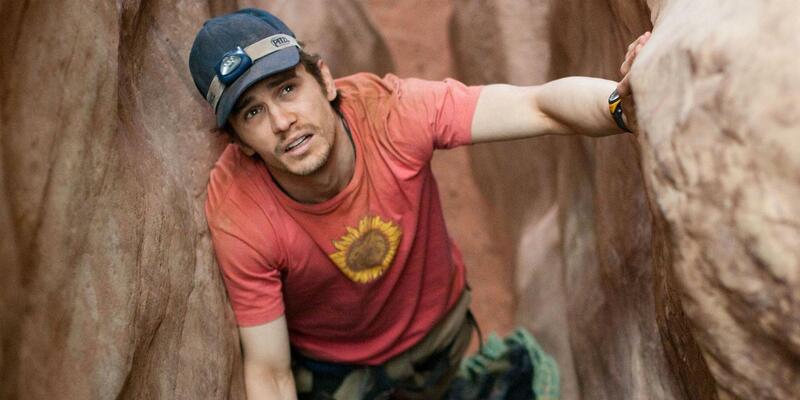 Directed, produced and co-written by the Academy Award-winning director Danny Boyle (Slumdog Millionaire), 127 Hours follows mountaineer Aron Ralston (James Franco) who, during a hiking trek in the Utah's Canyonlands National Park, ends up with his right arm pinned against the cliff face by a bolder. Alone in the wilderness, Ralston looks for a way to save himself and eventually settles on a desperate plan to amputate his own pinned arm. Boyle's movie is pretty much a word-for-word adaptation of the real events described by Alan Ralston in his 2004 autobiography Between a Rock and a Hard Place. For five days and seven hours, Ralston was pinned in the canyon until he broke his own bones and cut off his arm with a dull pocket knife. After barely managing to wrap the stump of his arm to prevent bleeding out to death, Ralston accidentally stumbled upon other visitors of the canyon who saved his life. Ralston later had his right arm cremated and ashes thrown into the canyon. Equipped with a prosthetic arm, he still travels the world and climbs mountains. On Friday the 13th, 1972, Uruguayan Air Force Flight 571 crashed into the Andes mountains. Nine people died in the crash or soon afterwards. Eleven days after the crash, the search for the airplane was canceled, to the horror of the survivors who could still receive but not send out radio messages. Eight more people died in an avalanche soon afterwards. As time passed by, survivors started succumbing to malnourishment and exposure. With very little food on board, survivors were forced to eat the bodies of their dead friends and loved ones. Alive was directed in 1993 by the frequent Steven Spielberg collaborator Frank Marshall. Based on the 1974 non-fiction book Alive: The Story of the Andes Survivors by Piers Paul Read, Alive chronicles the ordeal of the survivors as well as the final attempt by Nando Parrado (Ethan Hawke) and his friends to reach help. They succeed through desperation and sheer luck. While Alive puts a heroic face on the entire story, real Parrado summed up the whole ordeal thusly: "(T)here was no glory in those mountains. It was all ugliness and fear and desperation, and the obscenity of watching so many innocent people die." Bernie Tiede's murder of his 81-year old companion Marjorie "Marge" Nugent was such perfect material for a black comedy, it barely needed any improving. In a movie directed by Richard Linklater (Boyhood, Dazed and Confused), Jack Black does an amazing job of playing 39-year old Bernie, who starts socializing with an aged millionaire Marge (Shirley MacLaine). When Bernie grows tired of her abuse, he kills her and hides her body in a freezer. Since Marge is already despised and avoided by the locals of Carthage, Texas, it takes very little effort to convince them she's simply absent. Nine months later Bernie is arrested but, since he used Marge's money to help the community, district attorney Danny Buck Davidson (Matthew McConaughey) has to request a change of venue to ensure a fair trial. Bernie was based on a 1998 Texas Monthly article Midnight in the Garden of East Texas by Skip Hollandsworth, who also helped Linklater write the screenplay. Citizens of Carthage had some pretty conflicted feelings about Bernie's actions as well as the movie itself. In 1997, a jury sentenced Bernie Tiede to 50 years in prison for murder. For a while, he was paroled under the condition of living in Richard Linklater's garage. Bernie was finally resentenced in April of 2016 to 99 years in jail. Who would have guessed that the blockbuster auteur Michael Bay is a big fan of movies by Joel and Ethan Coen? Since the Coen brothers are well known for their noir crime films and black comedies, in 2013 Bay decided to make a black comedy of his own. He filmed Pain & Gain: a nasty, crude film about nasty, crude Florida bodybuilders who come up with a harebrained scheme of extorting money from the rich gym members by kidnapping and torturing them. Daniel Lugo (Mark Wahlberg), Paul Doyle (Dwayne Johnson) and Adrian Doorbal (Anthony Mackie) kidnap sleazy new gym member Victor Kershaw (Tony Shalhoub) and force him to transfer all of his assets to them. Afterward, they try to get rid of him by running him over with a car. Twice. The trio attempts a similar scheme again and that one ends even uglier. The entire story is based on horrifyingly violent, yet utterly incompetent crimes orchestrated by real Daniel Lugo and described in a series of Miami New Times articles written by Pete Collins. It's not often that a movie inspires an entire new subgenre - and a highly specific one at that! William Friedkin's 1973 horror masterpiece The Exorcist not only spawned two sequels and two prequels, but also originated an entire subgenre of horror movies dealing with demonic possessions. So what inspired The Exorcist? It was based on the 1971 bestseller novel by William Peter Blatty that was, in turn, inspired by the 1949 story about an exorcism of a boy known only as "Roland Doe" and "Robbie Mannheim". Born in the Lutheran family, "Robbie" allegedly started displaying signs of demonic possession after his beloved aunt died. A number of Catholic priests repeatedly performed exorcisms on him, eventually saving him. Seven decades later, it's hard to tell exactly was "Robbie" truly possessed, mentally ill or was he, as one researcher claims, merely a spoiled bully craving attention. If so, he sure got what he wished for, since they're still filming movies inspired by his case. In 2007, Stuart Gordon - the legendary director of Re-Animator - made a nasty little thriller called Stuck. In it, a nurse (played by Mena Suvari) accidentally hits a homeless man (Steven Rea) with her car while drunk and under the influence of ecstasy. When the man ends up badly hurt and trapped in her windshield, the nurse decides to leave him there to die hoping to hide his dead body later and thus avoid the police. It's a kind of an ugly story that makes you lose your faith in humanity. Unfortunately, it's also true. In October of 2001, former nurse's aide Chante Jawan Mallard struck homeless man Gregory Glen Biggs while driving her car under the influence of drugs. She then drove home, parked her car in the garage with a still-living man lodged in her windshield and slept the night away while Biggs bled to death. Mallard later hid the body with a help of her friends, but eventually got caught. She was sentenced to 50 years in prison. Craig Zobel's thriller Compliance is almost unbearable to watch. Sandra (Ann Dowd) is a manager in a fast-food restaurant. One day, she receives a phone call from a police officer (Pat Healy) who asks her to detain her employee Becky (Dreama Walker) as she's been suspected for stealing. Over several gruesome hours, Becky is subjected to a strip-search, a cavity-search and finally raped, all at the behest of one phone caller. It's only after one of the workers checks out the police officer's claims with the other managers that everyone learns they've been horrifyingly duped. From mid-1990s until 2004, an unknown person called various US fast food restaurants pretending to be a policeman. In each incident, the caller demanded that the restaurant managers detain and strip-search people - most of them employees, some of them customers. All of the victims were women, several of them underage. These incidents culminated in 2004 with a case that Compliance was based on. Police finally arrested David Richard Stewart, an employee of Corrections Corporation of America, suspecting him for these calls, but the jury acquitted him due to the lack of evidence. Edward Theodore Gein was a body snatcher, a murderer and an unlikely muse to horror film makers. He grew up in a poor household with an alcoholic father and a domineering mother. By 1945, Gein's family died and he developed a curious hobby: raiding the local graveyards for human body parts. In November of 1949 police searched his house looking for a missing store owner. They not only found her mutilated corpse in a shed, but also a house full of graveyard memorabilia made from tanned human skin. Gein committed only two murders that we know of, but their grisliness stuck in the public mind. Gein's case as well as Robert Bloch's horror novel Psycho inspired Alfred Hitchcock to make a movie of the same title starring Janet Leigh and Anthony Perkins. In 1974, young American filmmaker Tobe Hopper released The Texas Chain Saw Massacre, in which an entire family of cannibalistic human-skinning rednecks hunts down a group of teenagers. Finally, in 1991 Jonathan Demme adapted Silence of the Lambs: a novel by Thomas Harris that prominently features Buffalo Bill (Ted Levine), a serial killer who murders women and skins their bodies. What are your favorite movies based on true stories? Share them with us below!